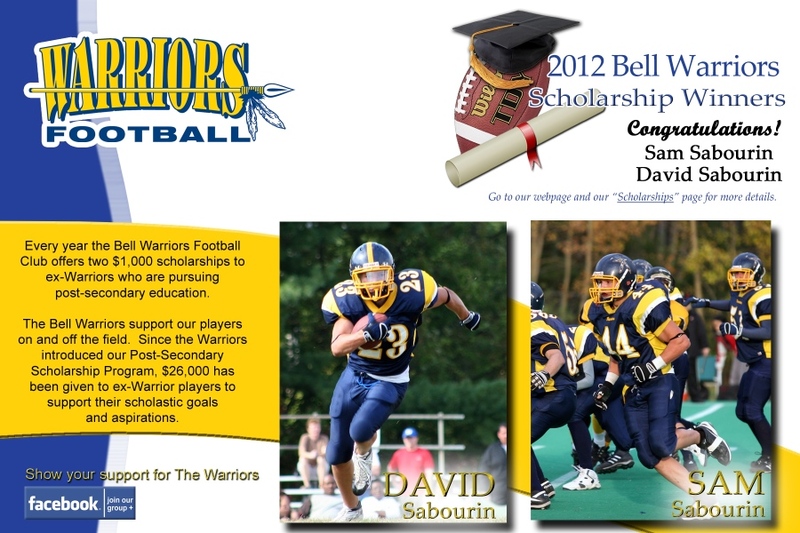 In 1999, the Bell Warriors initiated the Warrior Scholarship program offering two $1,000 scholarships to ex-Warriors who are pursuing post-secondary education. 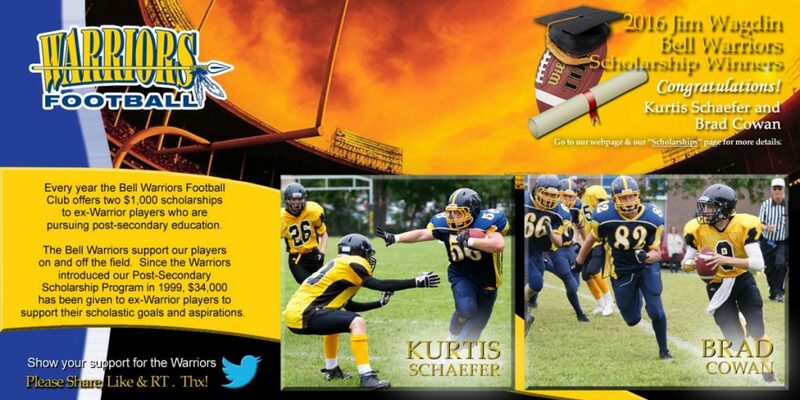 Participation in a post-secondary football program is not a prerequisite. 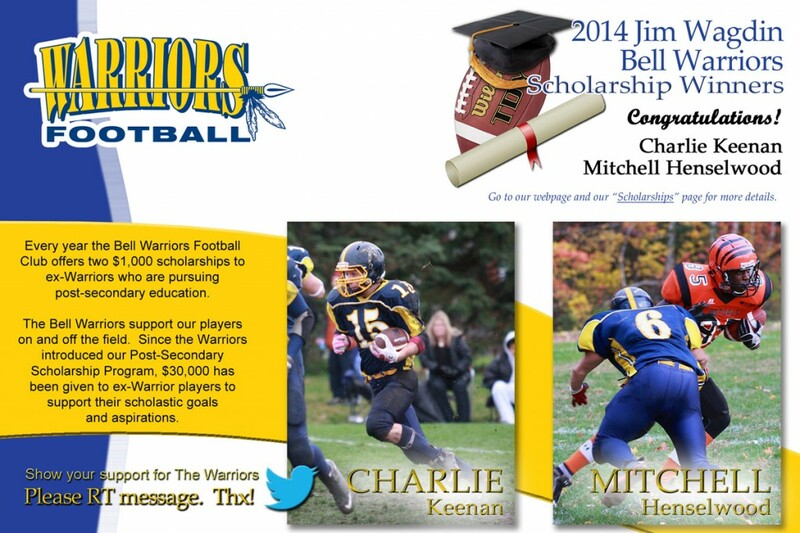 There are however, three selection criteria – Academics, Warrior Experience, and Community Involvement. 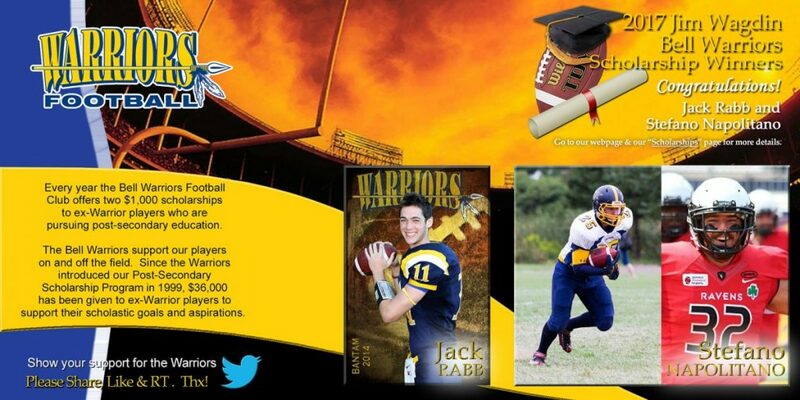 Applications must be submitted by August 1 and must include an original letter describing both the applicant’s experiences with the Warriors as well as his/her volunteer involvement with the community, a transcript of the applicant’s previous year’s marks, a notice of acceptance from the selected university/college (for first year students) OR a note from the school indicating the applicant’s return for a succeeding year, as well as any letters of reference. 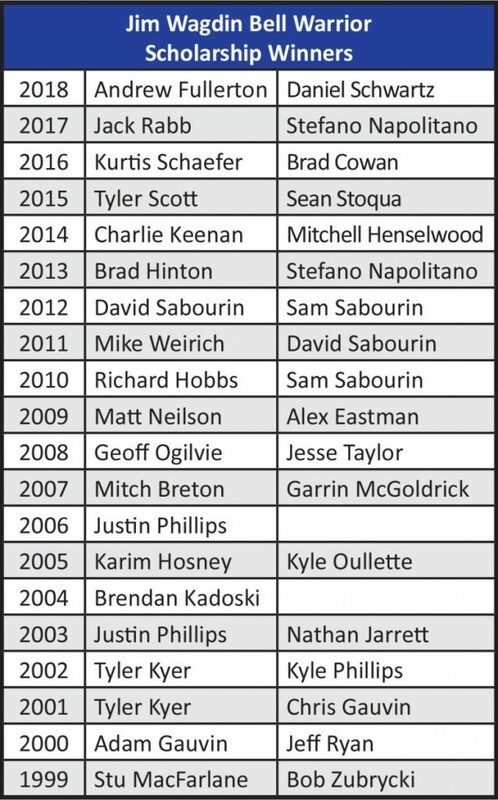 An independent committee, as chosen by the Club executive, makes the selections. $38,000 has been rewarded to date to Warrior alumni for their pursuit of post-secondary education. The Warriors support our players on and off the field! 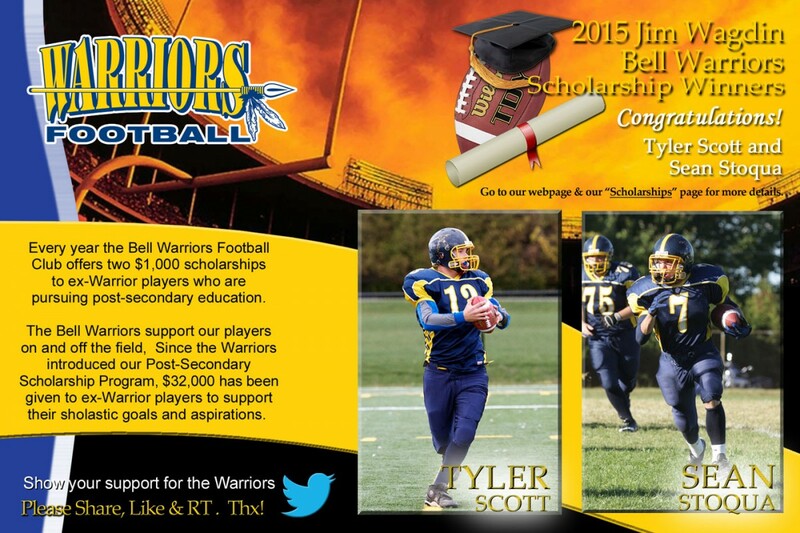 Jim Wagdin volunteered for the Bell Warriors for 24 amazing years as a coach, VP and eventual President of the Club until 2011. Mr. Wagdin was a man of character, dignity and distinction who set a tremendous example for our young players and families. 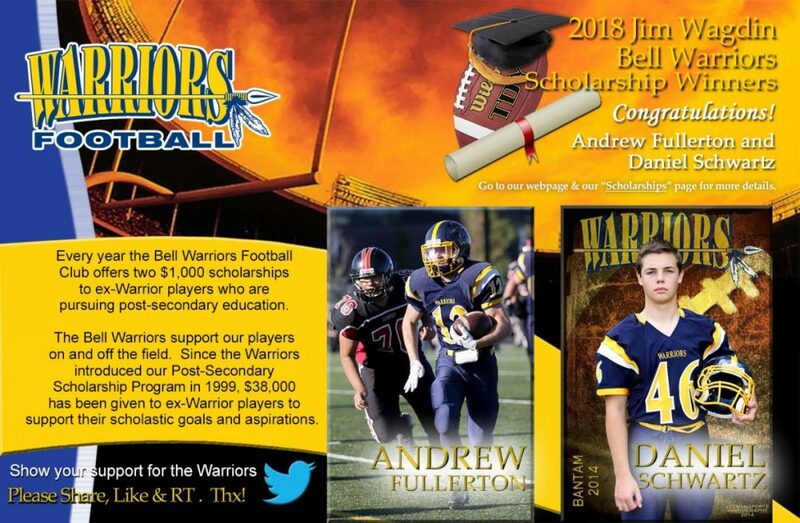 In 2011, upon his retirement from the Warriors, Jim was bestowed the honour as the Bell Warriors 1st Inductee into the Bell Warriors Hall of Fame. Pictured l to r: Brad Hinton #6, Jim Wagdin (Past President), Stefano Napolitano, Paul Stewart (President).